Minsk, the capital of Belarus, a modern city with enormous, austere buildings, an efficient public transportation system, a low cost of living, no crime, and fashionably dressed girls who crowd the clubs in the city center. Behind Oktyabrskaja Square, at the crossing with Karl Marx Street, between neo-classical palaces and architectonic monuments to Soviet constructivism, there is the residence of President Alexander Lukashenko. First elected in 1994 and confirmed in subsequent presidential electoral contests in 2001 and 2006, Lukashenko has built a strong and powerful government around himself, based on the state monopoly of economic resources, on holding all executive power in his hand, on media demagogy, as well as on repression of the opposition. The Western media refers to him as "the last dictator of Europe," while his supporters call him "bat’ka" (father), but Belorussians prefer not to speak at all, as 21-year-old Natalya confesses, "I’m afraid to talk about him." Alexander Milinkevich was the opposition presidential candidate during the 2006 electoral campaign. As the leader of the Movement for Freedom that reunites all the democratic forces in the country, he is the man in whom Western politicians have put their hopes to re-establish democracy in Belarus. According to Milinkevich: "The use of fear factor is normal in an authoritarian regime. Our government makes it simple—in Belarus we have no free market, everything is owned by the state, and people who think differently are fired. We came out of sixty years of the U.S.S.R. where the fear factor was also very significant, but today it has gotten even worst than during the Perestroika period. At that time, even though the media was controlled by the Communist Party, there still existed a possibility to meet, to talk freely, and there was something similar to free elections. Now, government officials as well as the members of Parliament are not elected but are 'nominated.' Fear and repression are two words that go together in the government’s way of thinking. I myself was arrested only once, after a public demonstration in remembrance of the Chernobyl's victims, but other activists such as Mikhail Marynich and Yury Bandazhevsky—the first scientists who worked on the sanitary consequences of the Chernobyl disaster—were treated in an even worse way. Not to mention the threats to relatives; my sons, who are studying in Poland, cannot return to their home country because they have been charged with military desertion." In a country that does not display an excess of either affluence or poverty, where the unemployment rate is under 2 percent, talking about politics, the economy or society is forbidden. "In Belarus we do not have the freedom of speech," said A. Aliaksandrau, a spokesperson of the Belorussian Association of Journalists (B.A.J.). "Slander against the government is punished as a criminal act. Moreover, all the press distribution systems are owned by the government, which obviously refuses anti-government publications." Control of every aspect of life is part of the intimidation strategy. K.G.B. 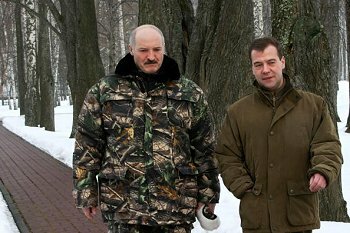 is still the name of Belarus’ intelligence service. "It's a fact here," explained Ales Lahviniec, the Movement for Freedom spokesperson, when we mention a man who followed us during our trip. Beatings and jail are the answers for those who speak up, who dare to rebel or to protest. On March 7, activist Yana Palyakova, imprisoned and brutalized by the police officers, killed herself because of the shame of the violence she had suffered. The day before, six young men were detained in Minsk for possession of the European Union flag. The authority does not only have the face of violence. "In the villages where there are no phones, no electricity, and no water supply, people think elections are a day for thanking the 'Father' who saved the country from the Western invasion," explained 23-year-old Olga. "Only entertainment and fashion programs and, naturally, the president’s speech about the greatness of Hitler and Stalin are broadcasted on television. The audience seriously believes that our president is a world-respected figure, just being provoked by U.S. and E.U. spies for being such an independent thinker." And the opposition? "As the leader of the opposition," explained Milinkevich, "I have only 30 minutes every five years to talk on TV, and no way to have a public debate with the president. Fifteen years ago Mr. Lukashenko won the election simply with a television contest and this is why today he is so afraid to give me the same possibility." "Foreign broadcasting is forbidden," said Aliaksandrau. "Only Russian channels are allowed, which are not better than our own, in terms of democracy. They promote a kind of 'Moscow-centered' vision of the world, which is quite dangerous in a country that had been under the U.S.S.R. for more than sixty years." Recently, the European Union has reopened a dialogue with the government of Belarus. Over 18,640 miles (30,000 km) of pipelines that run under this flat and marshy country providing one-third of the continent’s energy resources give a good reason to incorporate its economy into the European sphere of influence. "The new opening dialogues with the E.U. could be a great opportunity for us to restore civilization, but I’m afraid that this will make Moscow very nervous and that means raising the price of gas," stated the leader of the opposition. Russian pressure seems indeed behind the sudden postponement of the meeting with Benita Ferrero-Waldner, the E.U. external relations commissioner, which was scheduled for March 13. "First of all," added Aliaksandrau, "Bruxelles has asked our government to give more space to democracy. However, there are no real changes in the new Media Law, approved on Feb. 17, meaning, no changes in the media distribution system, no changes in the access to information, and none in the legislation. To the contrary, the authorities in their support of the international fight against terrorism are implementing a new amendment against extremism, which restricts the freedom of expression even more. Less than one month ago, Arche-Pachatak, a well known international magazine, was confiscated by the K.G.B. for presumed extremist content." And the future? What do people think about a European partnership? "The question stands: What does Europe know about us?" said Milinkevich. "We are born in a country that was very close to the Soviet Union. What is known about the U.S.S.R.? Lenin, Stalin, not much more. We really are a European country, our history is European history, our culture is a worldwide culture. We are part of the European family, we want to bring freedom by ourselves but we also expect solidarity with our European friends." "Europeans!" exclaims the forlorn Olga, "Do you really know what freedom is? Tomorrow you will leave. If you do not like a place, you will take flight to another one. We have to stay, we cannot escape. You talk about solidarity, human rights, and freedom but refuse to recognize our degrees, work, and education. We are dealt with as secret immigrants in your free lands and rejected back into the oblivion of this country out of time!"